There’s a bomb in my collection! It was back in August 2009. I had been working at the San Joaquin County Historical Society & Museum for about 8 months when a volunteer and I came across a box marked “ammunition”. It was a late Friday afternoon. 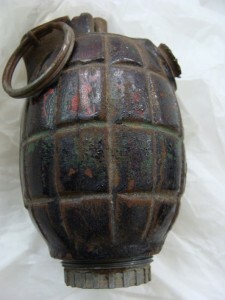 We opened it up to find World War II era hand grenade (with pin and not secured! ), a Japanese mortar round, and a canister that we assume based on the markings on it to be picric acid. 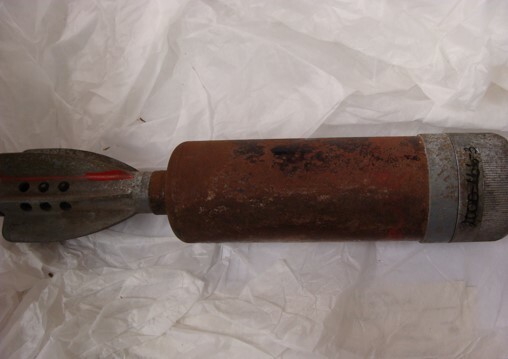 When this collection was first received by the museum in 2000, many of the potential objects were inspected by the San Joaquin County Sheriff’s Department and removed and detonated because they were deemed unsafe. For reasons unknown the current artifacts were either not inspected or deemed to be safe by the Sheriff’s Department. To this day I have no idea how or why these objects made it into the collection. So Monday morning, I contacted the Sheriff’s Department and a deputy came to have a look at them immediately, but apparently, military equipment was not his area of expertise either and I was waiting for him to pull the pin or something, it was kind of scary… Finally he talked to his supervisor and they contacted the local Air Force base. They sent their ordnance team to the museum to pick up the objects, which we immediately deaccessioned. I can tell you that sometimes ignorance is bliss because that was the longest weekend ever for me. I have since used these items as a teaching moment to point out to our docents, volunteers, and student tour groups about the hazards you sometimes find working in a museum. I hope to God that I never find anything like this again, that’s for sure. It gave us a really good scare! You never know what is in a donation until you unpack everything so be wary. I found five small bullets on the bottom in a box of nursing sisters regimental uniform buttons, badges, etc. from WWII. Of course they are live! Now on to locating the best place to have them deactivated. Yikes! Definitely a cautionary tale. A former colleague had a story about care handling unseen/unknown items on a top shelf: she pulled a reed bundle to the edge of the shelf and something fell out and nicked her skin. It was a poisoned arrow (South Seas – New Guinea? ); as it was over 100 years old she was not killed, just in bed for some three weeks. Auf der letzten ICOM-CC Konferenz im Sebtember in Melbourne wurde auch im Rahmen der Vorträge in Preventive Conservation über den Umgang mit Waffen und Munition im Museum of London berichtet. I remember visiting a depot once, where they had a sea mine from the second World War in storage. Apparently a local archaeologist transported the thing in the trunk of his car from the Belgian coastline all the way to Brussels, on one of the busiest highways in Belgium. To my own surprise, the people managing the storage facility weren’t sure if the mine had already been defused. I sincerely hoped so, because I was standing next to the thing! In Belgium in the region of Ipres even nowadays farmers often plow up live ammunition (grenades etc.) form the First World War. 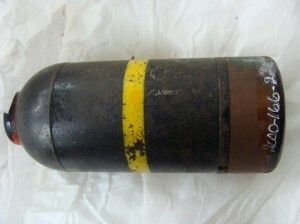 We have a special military demining service (DOVO) specialised in destroying or defusing these ‘artifacts’: http://www.mil.be/nl/eenheden/dovo (only in Dutch and French I’m afraid).